Which bug spray will tackle even the toughest pests? Check out our customer satisfaction ratings to find out. 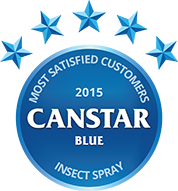 For 2015, we are able to report that Mortein has received our Most Satisfied Customers Award for insect spray. It’s estimated there are more than 10 quintillion (yes, that’s a number!) insects in the world. But for some people, the sight of just one creepy-crawly sends us running to the hills. Although insects are important for a functioning eco-system, most of us do not welcome them in our homes – and for good reason. Some insects can damage property, while others can carry disease. As you read this, cockroaches could be scurrying around your pantry or cupboard… Even if you’re not afraid of bugs, you probably don’t want them in your home unabated. Fortunately, 84% of New Zealanders agree that insecticides generally work well, our survey found. Around one in three households even take the extra step in protecting their property by using insect sprays pre-emptively to stop pests before they become a problem. Interestingly though, 20% of us feel guilty about killing insects, particularly woman and young Kiwis. But as the weather warms up, household insects are becoming more active, so you need to make sure you’re prepared to protect your home as best you can, and that’s where Canstar Blue can help. We’ve surveyed New Zealanders just like you from across the country to get their reviews of the insect spray they most recently bought, to help you decide which is best for fighting bugs. For 2015, we are able to report that Mortein has received our Most Satisfied Customers Award for insect spray. What insects do Kiwis find most frightening? Interestingly, we found that younger Kiwis are more afraid of insects than their parents or grandparents. 58% of respondents under 30 years of age admitted to being afraid of spiders, compared to only 35% of those aged 50 to 59. What do we want from insect spray? Our results show that most Kiwis want an insecticide that lives us to expectations and successfully fulfills its promise. When we spray a pest, we want to make sure it doesn’t get away to bother us another day, even if this means paying a little extra for the peace of mind. Understandably, 68% of respondents don’t like the smell of insecticides. So what’s the best alternative? Well, according to our survey, 40% of people say the next best way to deal with a pest is a good old fashion newspaper or magazine, followed by a fly swat (33%), then a shoe (25%). What is in insect sprays? Most conventional insecticides use a number of different neural-toxin agents to shut down an insect’s nervous system, thus killing them. The agents used by insecticide brands will usually differ depending on their spray’s intended purpose. For example, Mortein “Insect seeking fly spray” uses small amounts of allethrin andresmethrin, while some Raid cockroach sprays contain tetramethrin, cypermethrin and improthrin. Most insect sprays will not disclose its full list of ingredients, though it will tell you the key agents. This is normally found on the front, toward the bottom of the packaging. The chemicals in insect sprays are generally harmless to humans in low or infrequent doses, though it is advised to avoid spraying insecticides around small children or animals. Before using any insect spray, make sure you have read and understood the directions and safety warnings printed on all insecticide packaging. Mortein is a popular brand that you probably recognise from Louie the Fly or its catchy slogan. It produces a range of sprays, bombs, traps, repellents and more, to stop any unwanted pests both indoors and out. Mortein claims its product to be the smart and effective choice. Raid produces a range of indoor and outdoor sprays and repellents. Raid believes its product are the most effective insecticides on the market, evident by its slogan “Kills bugs dead”. Black Flag offers a number of traps and sprays for all kinds of pests. The Black Flag website claims that its pesticides have killed more insects for more years, than any other brand. Canstar Blue commissions Colmar Brunton using the SSI panel to regularly survey 2,500 New Zealand consumers across a range of categories to measure and track customer satisfaction. The outcomes reported are the results from customers within the survey group who have purchased and used an inspect spray in the last 6 months – in this case, 1,497 New Zealanders.